Lack of access to credit in developing countries traps farmers in poverty. At the same time, there is a lack of evidence that microfinance raises the incomes of the poor while maintaining high repayment rates. Using a field experiment in West Bengal, this column argues that incentivising local intermediaries to select loan recipients improves both average income growth and crop yields compared to traditional microfinance. There is no evidence that this strategy lowers equity, although some disadvantaged groups performed better in the existing system. For farmers in many developing countries, diversification into high-value cash crops has been an important path out of poverty. Travelling this path is often made harder by lack of access to credit. Poor farmers lack assets that could be used as collateral, and so there is a lack of effective means to ensure that loans are repaid. Formal financial institutions are, therefore, often unwilling to lend to poor. Microfinance institutions (MFIs) have solved many of the information problems in lending to the poor by using local relationships and social capital. Many experimental studies have looked for evidence that microcredit raises borrower incomes while maintaining high repayment rates, however, and found this has not been the case (Banerjee et al. 2015 and Field et al. 2013). The reasons for this failure are not well understood. One possibility is that microcredit as currently practised has been unable to screen and select productive borrowers. Unproductive borrowers are more likely to default, and so they pay higher interest rates in the informal credit market. When microloans become available, unproductive borrowers have a strong incentive to apply for them. MFI loan officers cannot identify these less-productive borrowers because they lack fine-grained information about the characteristics of individual borrowers. High-frequency repayments, and restrictions on risk-taking, may also prevent borrowers from using microloans for high-return projects like the cultivation of cash crops. In traditional communities, local informal lenders are better informed about the characteristics of individual borrowers. We experimented with a new method of tapping into this knowledge base, called trader-agent intermediated lending (TRAIL), to find out if it lenders can use it to select higher-quality borrowers. The MFI delegates borrower selection to an informal trader or lender in the community. The agent receives commissions that depend on how well the households he recommends repay their loans. This incentivises the agent to select borrowers with low default risk. Therefore, if default risk is negatively correlated with productivity, the agent would select a borrower pool with high average productivity. We devised and conducted a field experiment in two districts of the potato-growing belt of West Bengal, India, to test this idea (Maitra et al. 2016a). The experiment was designed to evaluate TRAIL against a traditional microcredit variant called Group Based Lending (GBL), which had similar loan features. We conducted the experiment in 48 randomly chosen villages in the districts of Hugli and West Medinipur. Potato is a cash crop that generates high mean returns, but is also risky. TRAIL was introduced in 24 randomly selected villages. In each village one TRAIL agent was appointed. This agent was randomly chosen from locals with substantial number of clients and business reputation. The agents were asked to recommend 30 local clients from households owning less than 1.5 acres of cultivable land. Ten of the 30 recommended clients were randomly chosen to receive individual liability loans from a MFI, and the TRAIL agent would receive a commission of 75% of the interest paid by the borrowers they recommended. The interest rate on these loans was set at 18%, compared to the 23% average informal interest rate for our sample villages. Each cycle, loans had to be paid back in four months. Loan size expanded by 33% from cycle to cycle if the previous repayments were made successfully, which provided borrowers with high incentive to repay. Borrowers were not required to repay weekly or monthly, to meet savings requirements, or to attend group meetings to report how they were using the loans. This allowed maximum flexibility in the choice of projects. The scheme also provided insurance against adverse covariate shocks to crop yields or revenues. In another set of 24 randomly selected villages, we introduced a traditional group-based lending (GBL) approach. We encouraged farmers to form five-person groups to apply for joint liability loans. Otherwise, loans were identical to those in TRAIL. We followed all other traditional microfinance practices such as frequent group meetings and savings requirements. Three times a year in each village we surveyed 50 households, randomly-selected, with the sample designed to include households that received loans ('treatment households'), households that were recommended or formed GBL groups but were not randomly selected to receive a loan ('control 1 households'), and households that were not recommended or did not form GBL groups ('control 2 households'). Comparing outcomes of control 1 and control 2 households enabled us to evaluate selection induced by each scheme, while comparing treated with control 1 households yields loan treatment effects, controlling for selection. 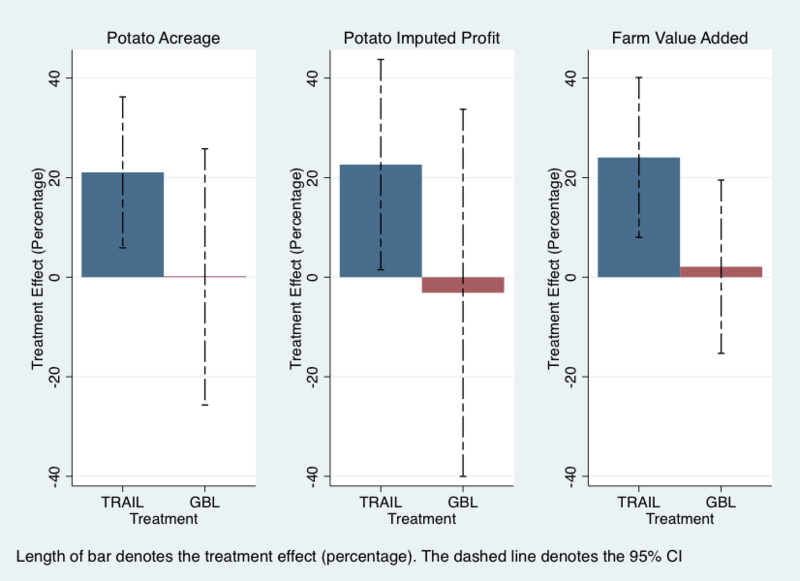 TRAIL loans generated significant average treatment effects (ATE), all exceeding 20%, on acreage, profits with potato cultivation and aggregate farm incomes (Figure 1). The corresponding effects of GBL loans were noisier and statistically indistinguishable from 0, which is consistent with other experimental studies. We also did not find any evidence that TRAIL agents were manipulating prices or quantities in other transactions to extract part of the borrower's benefits. In both schemes, repayment rates were 95% over three years. Loan take-up rates were 92% at the outset, falling to 62% after three years in the TRAIL scheme, while for GBL, the corresponding figures were 88% and 49%. The TRAIL scheme saved administrative costs by avoiding group meetings. As it also had higher take-up rates and identical repayment rates, financial performance was superior to GBL. TRAIL selected more productive borrowers, who achieved higher returns on their loans. 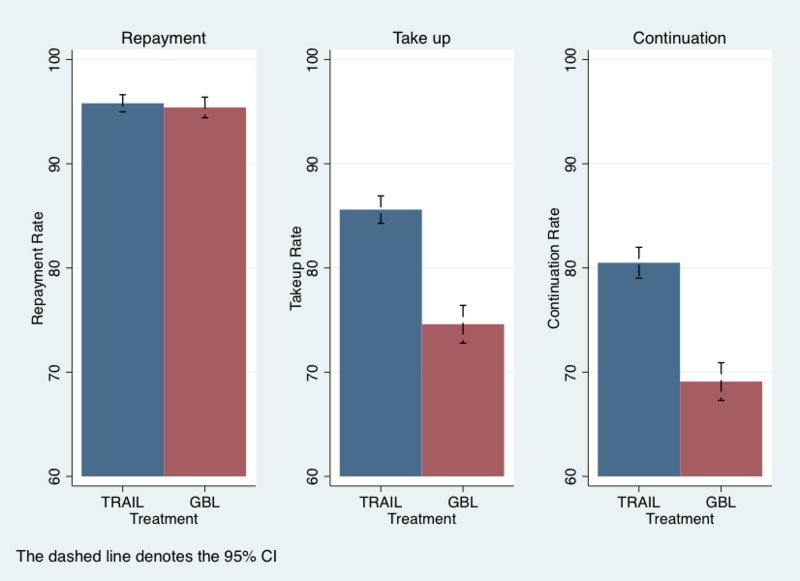 We also find that even when taking ability into account, TRAIL borrowers achieved higher returns. This reflected superior incentives, because of the individual liability feature of TRAIL loans and absence of monitoring by peers or MFI officials. Both effects raised ATEs in TRAIL, compared to GBL. Selection differences were responsible for approximately one-third of the difference in ATE. Efficiency might have come at the expense of equity. If productivity was correlated with observable economic or social status, then the benefits of TRAIL might be concentrated among the better off, which would raise inequality among the poor. Also, by admitting a mixture of low- and high-productivity borrowers, GBL may have created a more even distribution of gains. We estimated the welfare impacts of the two schemes for a range of parameters of inequality aversion, which we set out in Maitra et al. 2016b. We found that, irrespective of inequality aversion, TRAIL always welfare-dominated GBL when households are differentiated by the land they own. This is because TRAIL allowed landless households to participate on par with other groups, and achieved substantially higher income growth than counterparts in GBL. Welfare comparisons are ambiguous for high levels of inequality aversion when households are differentiated by caste and religion, as some specific social groups achieved higher treatment effects in GBL. This is possibly because members of these groups had high social capital. If achieving high impacts on borrower incomes and enabling increases in cash-crop production are important policy goals, TRAIL is a promising alternative to traditional microcredit. Our results indicate that the impact on income can be achieved without compromising repayment rates or the financial performance of traditional micro-lenders. It is possible that local lenders may abuse their power, and so we limited the scope of their involvement. We found no significant variation in other transactions with borrowers. We also found no evidence that TRAIL lowered equity when households are differentiated by economic status. On the other hand, some traditionally disadvantaged social groups performed better in GBL. Policymakers who have a remit to help these groups could combine both TRAIL and GBL. In this scenario, the poorest and the most vulnerable households can take group loans, while TRAIL would be used to achieve better income growth for others. However it is achieved, involving local intermediaries to create innovative ways to broaden market access for the poor seems a promising approach to promoting inclusive growth. Banerjee, A V, D Karlan and J Zinman (2015), “Six Randomized Evaluations of Microcredit: Introduction and Further Steps," American Economic Journal: Applied Economics, 7(1), 1-21. Field, E, R Pande, J Papp and N Rigol (2013), “Does the Classic Microfinance Model Discourage Entrepreneurship Among the Poor? Experimental Evidence from India," American Economic Review, 103(6), 2196-2226. Maitra, P, S Mitra, D Mookherjee, A Motta and S Visaria (2016a), “Financing Smallholder Agriculture: An Experiment with Agent-Intermediated Microloans in India”, mimeo, Boston University. Maitra, P, S Mitra, D Mookherjee and S Visaria (2016b), “The Distributive Impacts of Microloans for Smallholder Agriculture”, mimeo, Boston University.